The engines are roaring again. 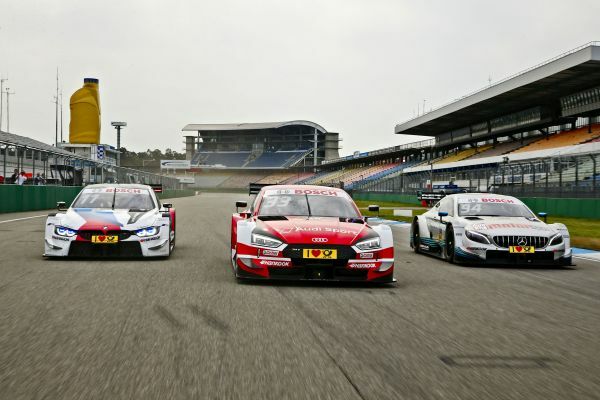 The unofficial DTM season kick-off saw some drivers turn laps of the Hockenheimring Baden-Württemberg on Monday. This sound was music in the ears of the motorsport fans who can hardly await the start of the first two races at the same venue (4-6 May). Pascal Wehrlein was one of the first drivers to get behind the wheel at the start of the four test days. “For me, it is a little bit like coming home. Compared to the past, I didn’t notice any major changes in the car. The biggest change for me will be to deal with the tyres without tyre warmers. When the car enables me to do so, I want to continue at the point where I left off in 2015,” the returnee from Formula 1 said during the press conference. Three years ago, the Mercedes-AMG driver bowed out of the DTM after winning the title. 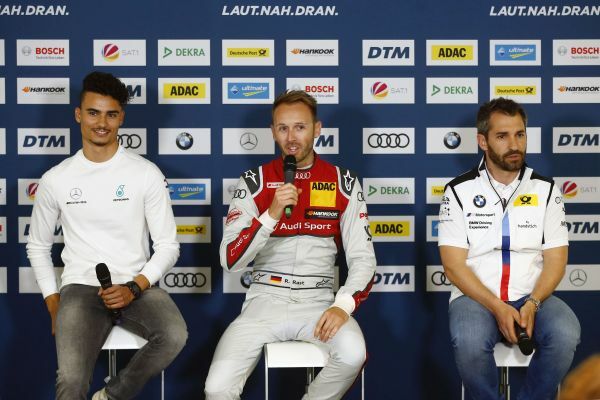 René Rast appeared on stage wearing his race suit, but the DTM champion hadn’t sat in the car yet. “The field will be even closer together. The right steps to achieve this have been made,” the Audi driver said referring to the reduced downforce of the cars. Obviously, defending the title is his goal. Planning such a thing, however, is impossible in the DTM where the slightest details can decide about victory or defeat. “My first year as a rookie really went surprisingly well for me. At the beginning of the season, I hoped to score one point at all. Now, I know that I am in a position to be a contender up front. I am very relaxed,” said Rast, who was in a good spirit. In spite of a jet lag, Timo Glock also came across as very cheerful. On the weekend, the BMW driver had commented the Formula 1 race in Bahrain, boarded the plane at 2 am and only landed in Germany at 7 am. “I am saying this every year. In fact, I can play a tape. I will never say in the DTM that I will be a contender for the title this year. It is the small things that matter, everything is so closely together. Last year was my strongest so far, that is a fact,” said the 36-year-old, who has been racing in the DTM since 2013. A change at short notice has been made to the DTM support package. Due to an insufficient grid size, Audi Sport ABT will now not be continuing the TT Cup by itself as initially planned. “We regret that Abt Sportsline had to abandon its plan. However, the DTM fans will not have a lack of motorsport action in the support series as a result. With Formula 3, Formula 4 or the Audi Sport Seyffarth R8 LMS Cup, we already have an attractive and varied programme. And we are working hard to find a replacement to fill the slots that have become vacant,” Achim Kostron, managing director of ITR GmbH, said. DTM fans who don’t want to miss out on the prelude to the season opener have free access to the south grandstand on the upcoming days until Thursday evening and can thus follow the test sessions of the cars on site. The new DTM season gets underway at the Hockenheimring Baden-Württemberg from 4-6 May, 2018. Tickets are available online at www.dtm.com/tickets and from the hotline +49 (0) 1806 386 386 (0.20 Euro/call including VAT from a German landline, max. 0.60 Euro/call including VAT from the German mobile phone network).